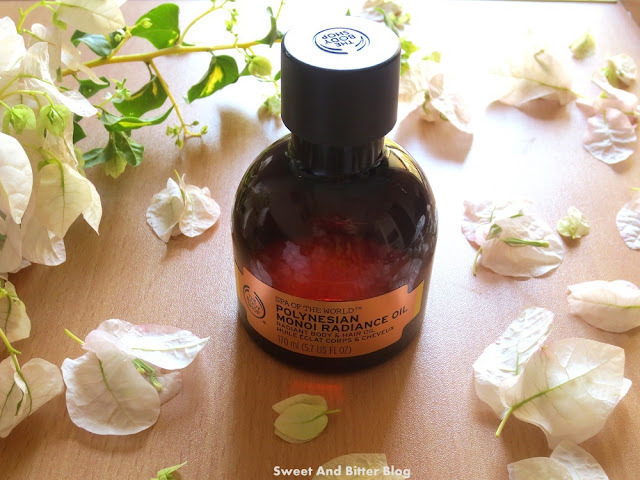 An oil from The Body Shop Spa of the Wold Collection that can not only be used on skin and also for hair - Polynesian Monoi Radiance Oil. Monoi means the blend of coconut oil and fragrant Tiare flowers. Packaging: Dark ombre plastic bottle with screw-in cap and dropper. The darker color of the bottle will help retain the goodness of the oil for long. Fragrance: Floral coconut. The fragrance is what attracted me most about the oil. 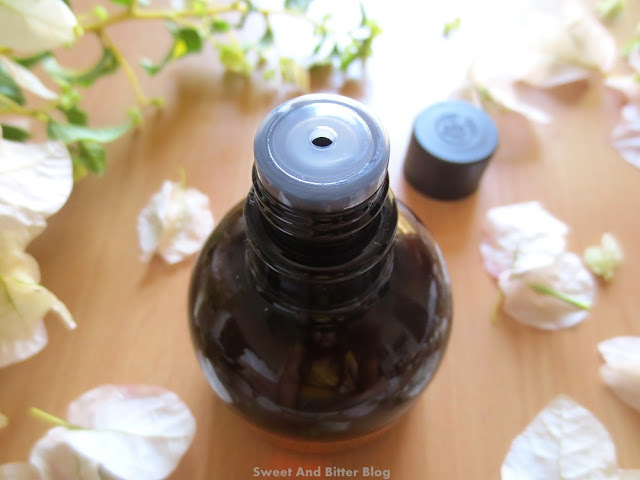 Usage: What makes it stand taller than the other oils in the Spa of the World range is that this oil can be used for the skin as well as hair. 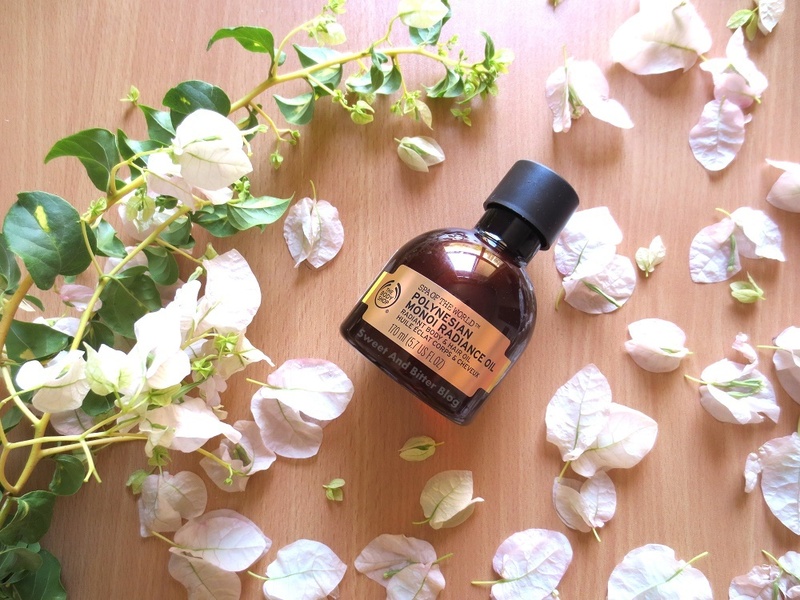 Not only it is a massage oil, it can be used to tame frizz and also as a hair oil. Effects: I love using it after shampoo. Just a drop of it on the ends and tangles be gone! Do not use too much as it might weigh down hair. Because of the beautiful fragrance, I have been tempted to use more at times. The beautiful floral nutty fragrance stays for long. As it is basically sweet almond, sunflower, and coconut oil, it is good for skin as well as for hair. I apply it before shampoo as well and it washes off easily leaving behind soft smoother hair. Ingredients: Prunus Amygdalus Dulcis Oil/Prunus Amygdalus Dulcis (Sweet Almond) Oil (Skin Conditioning Agent), Helianthus Annuus Seed Oil/Helianthus Annuus (Sunflower) Seed Oil (Emollient), Bertholletia Excelsa Seed Oil (Emollient), Cocos Nucifera Oil/Cocos Nucifera (Coconut) Oil (Emollient), Parfum/Fragrance (Fragrance Ingredient), Sesamum Indicum Seed Oil/Sesamum Indicum (Sesame) Seed Oil (Skin Conditioning Agent), Benzyl Salicylate (Fragrance Ingredient), Tocopherol (Antioxidant), Gardenia Tahitensis Flower Extract/Tiare (Gardenia Tahitensis) Flower Extract (Skin Conditioning Agent), Benzyl Benzoate (Fragrance Ingredient). 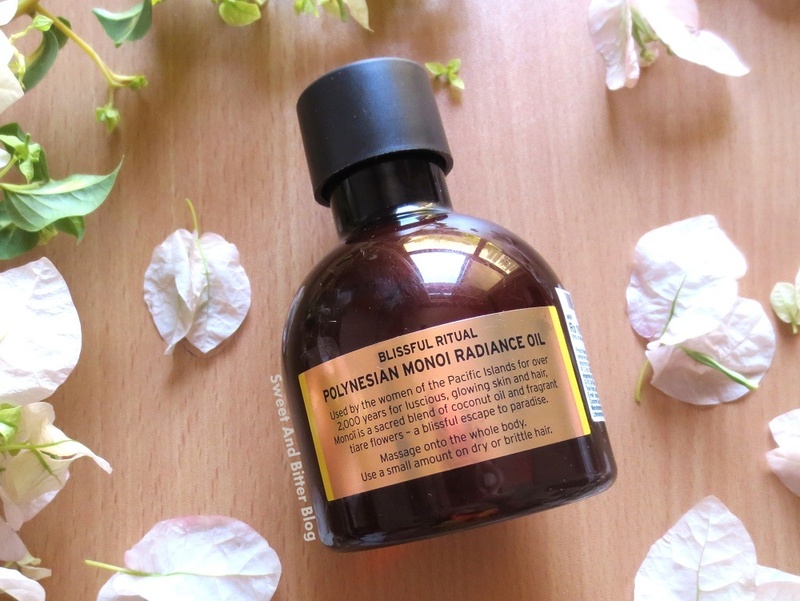 Overall: I love TBS Polynesian Monoi oil. What makes it one step better than French Lavender Massage Oil is the fact that it can be used for hair as well as skin. It is tough not to like the product because of the fragrance - tropical vacation in a bottle. You cannot even deny that the radiance oil actually delivers. I loved it a lot. Price is on the higher side but it will last me for a long time. Keep an eye for offers and grab it when you can.